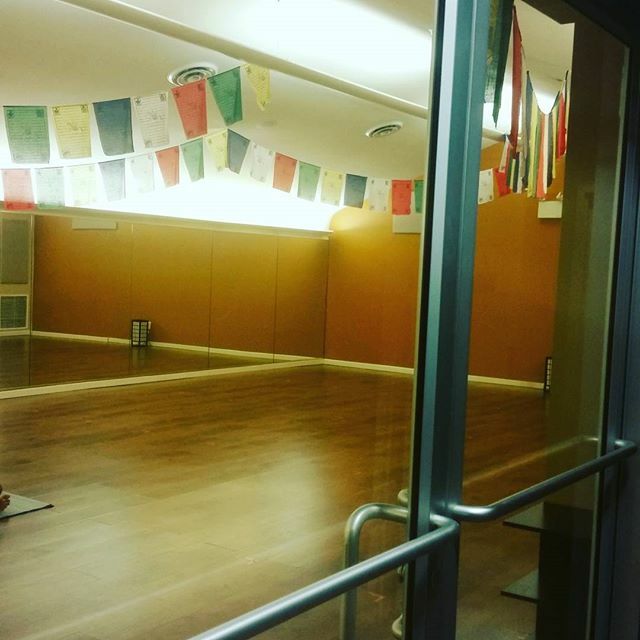 Workout: Hot Vinyassa Yoga- 1hr. Breakfast: small vanilla nonfat latte, half of a Lemon Meringue flavored Greek yogurt and some raw almonds and walnuts. 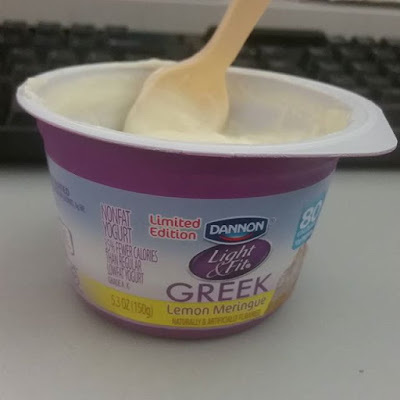 (The yogurt was just okay and I wasn’t too hungry). Lunch: buffet!! 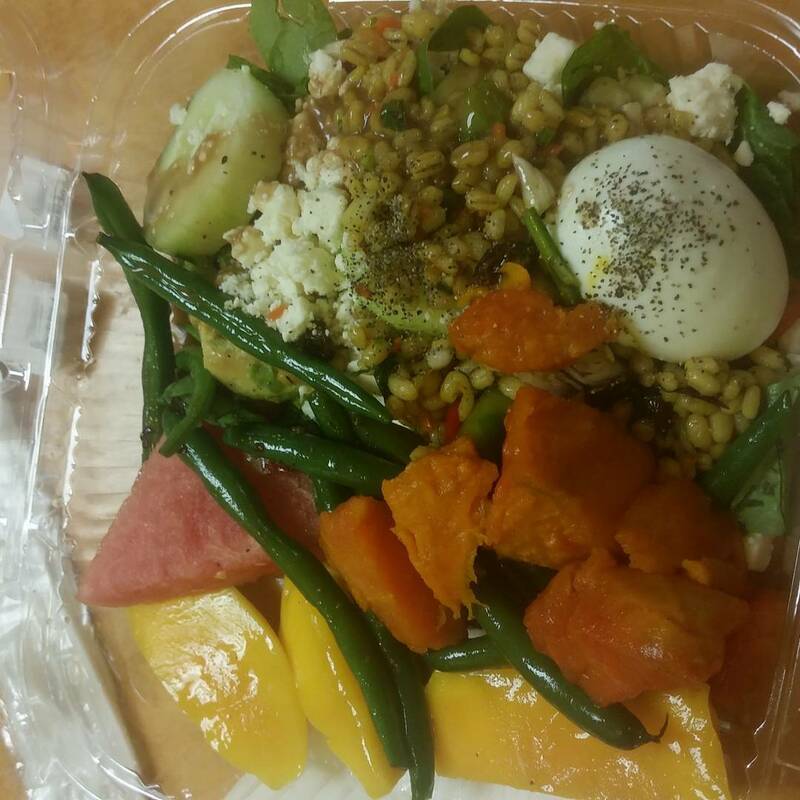 I opted for healthy and filling: a small spinach salad with three cucumbers, 3 chunks of avocado, 3 cooked yams, a couple cooked string beans, a barley and rice mixed salad with feta and dried cranberries, one slice of watermelon and three slices of fresh mango and 1 lonely hard boiled egg. A little bit of balsamic vinaigrette. I ate most of it. It was goooood. Dinner: Grilled Salmon. No Photo. Was hungry and too lazy. Once I sit on the couch, all bets are off. Rest assured, it was so yummy! Today I went in the office, a bit bleary eyed and in shock mode upon first waking up. I must have been in really deep sleep because I know I had crazy dreams, but don’t actually remember what kind specifically. My alarm went off at 5AM and I for a minute, had no clue where I was or what was happening. I literally jumped out of bed, ran to my phone that I purposefully place across the room, turned off my annoying alarm and promptly got dressed for hot yoga that was to begin at 530AM. It’s about a 10-15 min. drive to there from my house. I packed my big “workout” bag with work clothes and it already had shower staples inside so I was set to go. It’s been a few weeks now of, as I like to say, over-indulging on amazing food. My husband and I are well aware that we’ve gone overboard on ice cream and donuts over the past month, eating out a little more than necessary instead of eating in and cooking our own food, but I do know we have savored enjoyed every.single.bite. Because let’s face it, food IS amazing. I wouldn’t say we’ve gone crazy with devouring huge portions, and we both don’t snack too often. I love snacks just a much as the next person, but I’ve been trying to focus more on eating “meals.” And foods that are whole and can keep me fuller longer. It’s a struggle for me certain days, especially when I work from home because I want to eat all the things! I think everybody experiences that feeling at one time or another. So back to the overboard on dessert train for a minute. The hubs and I decided that in order to regain some of our control over food choices, in this case desserts, we are cutting them out until the Holiday season. I can’t and will not go without a slice of pumpkin pie at Thanksgiving. His birthday actually falls on Labor Day this year and we’re going out to dinner to celebrate, which I’m sure we’ll indulge in a dessert of some sort. So yes, up until that night out we won’t be having ice cream or cake, and the day after his birthday until Thanksgiving, no ice cream or cake or pie. Halloween will be interesting. I don’t think I’ll buy candy to hand out because we’ll be taking our daughter who is only 2 ½ out to trick or treat and then probably go out to dinner afterward. This doesn’t mean I may not freeze any Reese’s cups she might get and maybe let her try half of one. Who’s to say? It’s Halloween. But regardless, we both definitely need a little break up with ice cream for a bit. Dinner tonight is grilled Salmon. Oddly, Salmon fills me up on its own and I looove that. If I do feel a bit hungrier, I’ll have some carrot sticks or make a small salad with cucumber. I like to go with how I feel. Can you guess who will be cooking dinner? HUSBAND!! Salmon on the grill is just the best! At the point, I think we have Salmon once every 2 weeks? But it varies. If I feel like I need something sweet later after dinner, I’m set up with healthy options. I have chunks of watermelon in the fridge, yogurt and strawberries. Hope you had a great Tuesday! For thick material the measurement of the viscosity is done in the KU meter is gives the units of the kerbs unit and can be measured from 45 to 145 KU and have the high accuracy because in this from the human is being eliminated by the machine.